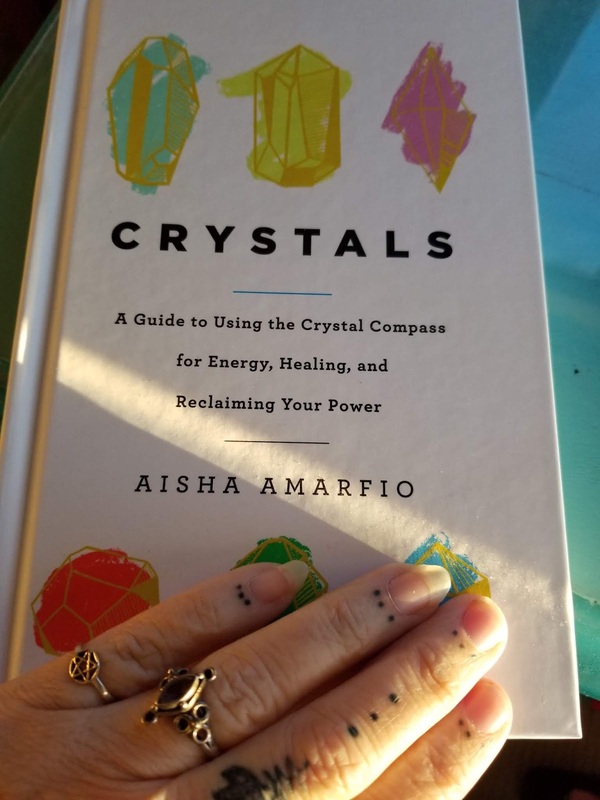 Today I'm reviewing Crystals - A Guide to Using the Crystal Compass for Energy, Healing, and Reclaiming Your Power by Aisha Amarfio. As with all my reviews I'll start with a review of the physical book. It is a small book, in that it can easily fit into a backpack or purse for reading on the go. I received a hard copy w/o a dust jacket to review. The outside is smooth and has color images of the author on the back as well as two large crystal compass on the front and back inner cover. The index is very small. Only two pages provided, both front and back one for the Symptoms Index and one for the Results Index. 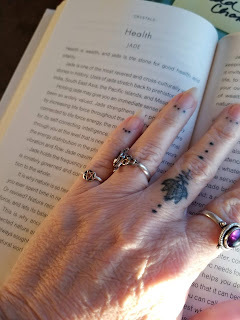 The introduction is quite lengthy and the author gives us her background on using crystals and the history of the crystal compass. 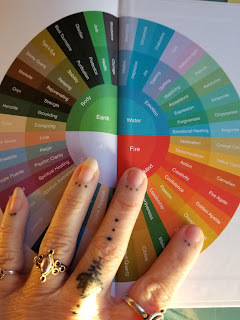 I enjoyed the section on how crystals work and their relationship to using their elemental qualities for wholeness. This fits directly into several certifications I recently completed related to crystal healing. This compass is a great way to bring those elements together in one place for ease of use and clarity. This book limits illustrations but the text is well written and easy to read. The book contains a plethora of information and each chapter expands on the next in a linear but expansive thinking mindset. 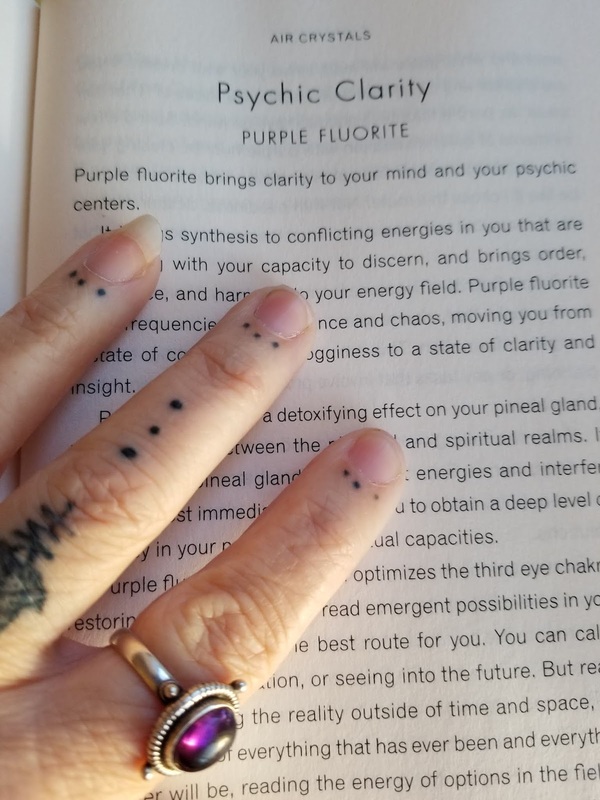 The chapter on using crystals takes us through cleansing and creating a sacred space as well as defining earth, water, fire and air crystals and how each should be cleansed. The energy exercises included are extremely helpful and I highly recommend taking the time to complete each in these initial chapters. The remaining chapters of the book are separated by elements. Each chapter defines the area of life, symptoms of imbalances, how to nourish the physical energy body as well as exercises to "check in" on your current vibration state. It is then followed by a chapter on that particular element's crystals and what they work with. 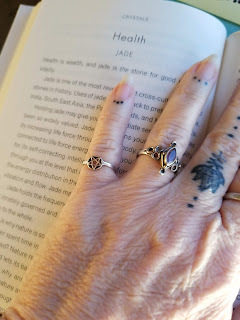 The author tells us that the earth crystal related to earth is Jade. 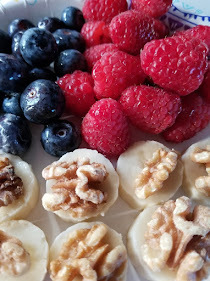 It is for good health and vitality. I won't give away all the tips on it but I will say that each chapter on the elemental crystals provide the original source location, history of the crystal as well as the qualities, what its good for, issues and a mantra in a quick reference section at the each of each description. 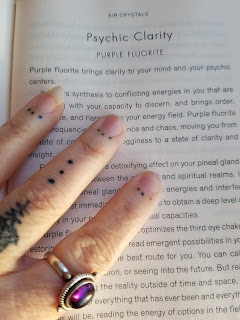 One of my favorites was the section on the Air Crystal - Purple Fluorite - the qualities are mental clarity, psychic clarity, order and harmony. 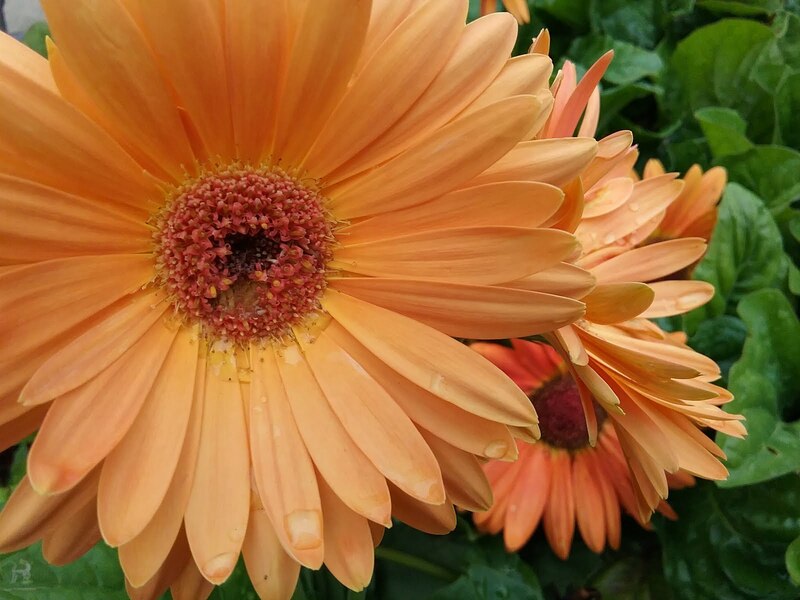 Its good for clearing energy fields and problem solving. It will help with confusion, or poor concentration. The mantra provided is amazing. I am clear, I think clearly, I see clearly, I perceive clearly, and I make my decision. Overall what I approached as "Just another crystal book" actually turned into something that I will refer to time and time again. The author provides a great introduction as a beginner book, but then challenges the reader to rethink some of the old jargon around crystal healing and crystal work. This is a fantastic addition to any metaphysical or crystal healing library.